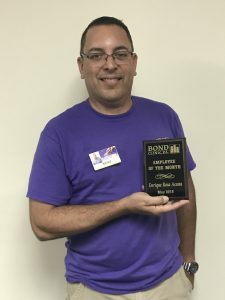 Employee of the Month - May 2018 - Bond Clinic, P.A. Bond Clinic, P.A. Congratulations to Enrique “Ricky” Rosa Acosta for being selected as the May 2018 Employee of the Month! Ricky is our Mail Clerk and he began his employment at Bond Clinic in January of 2014.